I have three kids and I try my best to cook recipes that they can make. They are still little so the shorter the project the better. This Simple Easter Recipes for Kids was created by my children. They told me what they wanted to make for dessert and well we made it. I feel like cooking should be self directed and finding recipes that allow for creativity is key. This allows your child to problem solve and apply logical thinking strategies. This recipe is easily adapted for children of all abilities since it involves gathering the materials and combining them as the child sees fit. We started out with as many peep options as possible I mean you need options right? I think we were successful in our creation. I know that my daughter had a wonderful time using the items we had gathered to make her special dessert. I have to say she had a heavy hand with the sprinkle but who could blame her it sprinkles. I encourage you to get in the kitchen with your children and get cooking. 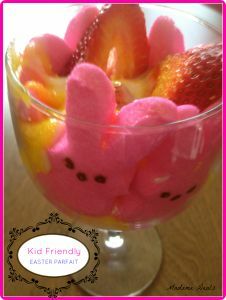 You can make up your own simple easter recipes for kids or any theme really. I find that the best memories I have with my children are the ones involving allowing them to be creative. Check out our cooking with kids series and cook up some love! Recipes kids can make and memories we can take with us forever series share and inspire others today.